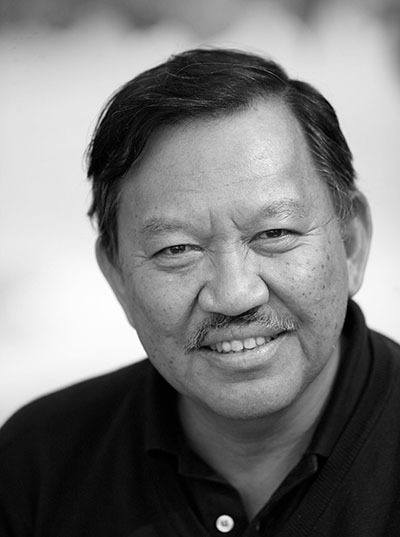 Baldomero (“Toto”) Olivera grew up in the Philippines; he received his B.S. degree in Chemistry from the University of the Philippines, his Ph.D. working on the Biophysical Chemistry of DNA at Caltech, followed by postdoctoral work in Biochemistry at Stanford. His early research contributions include the discovery and biochemical characterization of E. coli DNA ligase, a key enzyme of DNA replication and repair that is widely used in recombinant DNA technology. He is presently a Distinguished Professor of Biology at the University of Utah. Toto Olivera initiated the characterization of the venoms of the predatory cone snails. A large number of peptide neurotoxins ("conopeptides") are present in these venoms, and their characterization led Olivera’s research group to a broad involvement with molecular neuroscience. Conus venom components are used to investigate the function of individual ion channels and receptors. The cone snail project has raised wide-ranging biological questions, from mechanisms of protein folding and post-translational modification, to gene organization and mechanisms of speciation. Several peptides discovered in Olivera’s laboratory reached human clinical trials and one (Prialt) has been approved for the treatment of intractable pain. He is a member of the American Philosophical Society, the U.S. National Academy of Science, and the Institute of Medicine. He was given the Outstanding Alumni Award of Caltech, the Redi Award from the International Society for Toxinology and the Harvard Foundation Scientist of the Year 2007 Award. As an HHMI professor, Dr. Olivera has implemented an outreach program to instill an interest in science in young students by educating them about scientific principles they can observe in the organisms that they see every day.